The film paints a portrait of Mikhail Gorbachev, the former President of the Soviet Union who brought about changes to end the Cold War, toppled the USSR, and enabled the reunification of Germany. 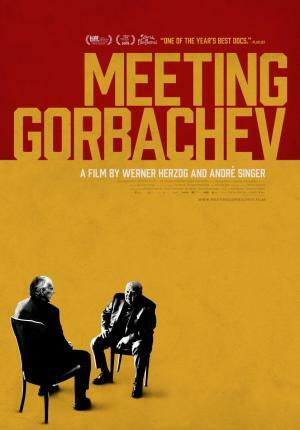 Herzog and Gorbachev engage in an intense conversation about the past and the winding path of History. "[It] is not his most visually striking (since it is composed primarily of talking heads), but it is certainly one of his most pertinent and fascinating." "We might have hoped for a more sparky encounter, but 'Meeting Gorbachev', though consistently engaging, is less a fireworks display than a fireside chat, and so feels curiously like an opportunity missed." "The film he’s made from their time together is a nostalgic, grateful, and surprisingly tender"
"Thanks to Herzog’s keen eye at having a continuous fluid flow to the story, this is one of the most important documentaries of the year because it still feels fresh and relevant to our times."